If you want to lose more weight and keep your heart healthy, then read this important post about coffee, fat, and sugar. For decades, the American Medical Association (AMA) told us that fat was BAD. Doctors encouraged us to eat a low-fat diet in order to avoid high cholesterol levels. They hypothesized that high-fat diets led to high cholesterol, heart disease, and increased mortality rates. However, the latest research disproves this hypothesis. Healthy fats can actually IMPROVE cholesterol levels and benefit heart health, as well as aid in weight loss. People who trade healthy fat for extra sugar weight more and develop heart disease more often than those who follow a higher-fat, low-carb (low-sugar) diet. While the food industry removed much of the fat in their products in order to appeal to the new, low-fat movement of the time, they also added sugar in order to ensure that their foods tasted good. As a result, often times, low-fat foods contain MORE sugar than their full-fat counterparts. For example, take a look at the following photo. 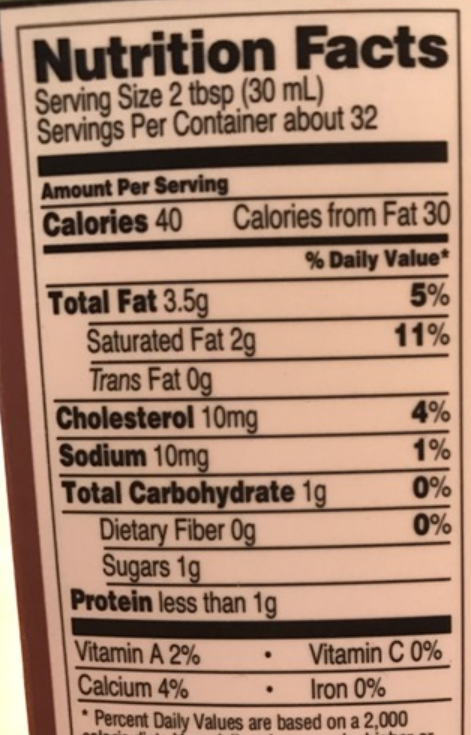 This is the nutrition label from a quart of Trader Joe’s Organic Half and Half. The next photo is the nutrition label from a quart of Organic Valley 2% Reduced Fat Milk. Upon first glance, we see that the number of calories and calories from fat appears to be LOWER in the Half & Half… but is it? Unfortunately, no. But, the number of calories in a food is the last thing you should worry about. Many of the most nutritious foods on the planet are high in calories. For example, 1 cup of avocado contains approximately 240 calories and 21 grams of fat. However, avocado is an incredibly nutritious (and satisfying) food. In order to make a proper comparison between the two food labels above, the first thing we need to do is look at the serving size. Comparing the nutrition of a full-size, healthy protein bar (“Servings per bar is 1.”) to the nutrition contained within one-quarter of a Snickers Bar would be an unfair comparison. Wouldn’t you agree? So, looking at the labels above, we need to multiply EVERYTHING on the Half & Half label by a factor of 8! Why? Because the ‘Serving Size’ of the Half & Half is only 30 mL and the ‘Serving Size’ of the Reduced Fat Milk is 240 mL. That’s 8 times the quantity of the Half & Half (30 mL x 8 = 240 mL). Now that we have been fair to the milk by leveling out the playing field, let’s look at the facts. And, while we do this, please keep in mind that this is not the only food that we will be consuming during any given day. Therefore, we do not need every one of our nutritional needs to be met by way of this one serving of milk/cream. In addition, we have scaled up the serving size of the Half & Half to one cup. But, do we ver go to the refrigerator with the intent of having a cup of Half & Half? Of course not. 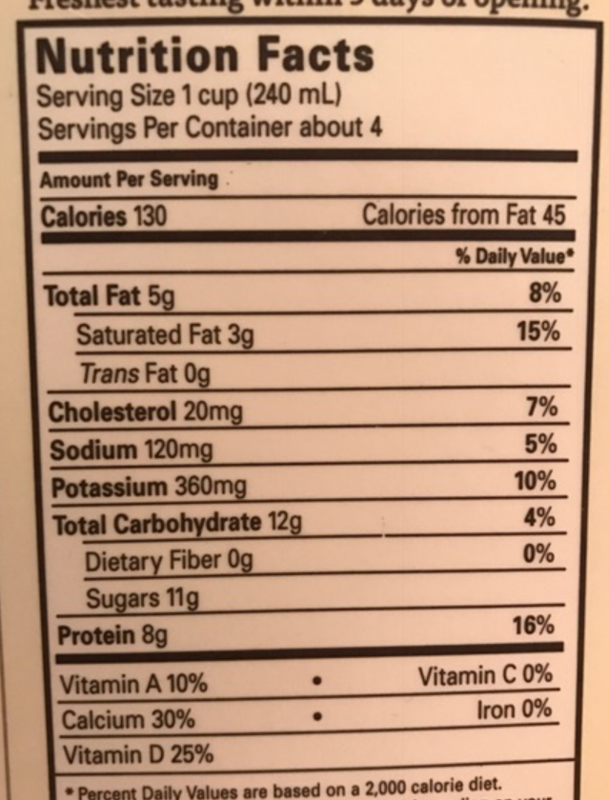 In fact, that’s why the Nutrition Fact on the label are calculated for only 1/8 of a cup- because that’s the quantity most people are likely to use in their morning coffee. So, although we needed to multiply the nutrition of the Half & Half by 8 in order to compare the calories per serving, you aren’t going to be adding a full cup of Half & Half to your coffee, so you won’t be adding 340 calories either. So, keep this in mind. The Half & Half contains 2.5 times the calories and approximately 5.5 times the fat calories per serving as does the Reduced Fat Milk. That much should make perfect sense since the milk claim to be “Reduced Fat.” Additionally, the amount of Cholesterol in the Half & Half is 4 times the amount found in the Reduced Fat Milk. However, we know from research that dietary cholesterol has very little, if any, effect on blood cholesterol levels. Therefore, like the number of calories, you shouldn’t worry about the amount of cholesterol that you will be adding to your coffee (10mg). And, although the Total Fat and Saturated Fat in the Half & Half are both approximately 5.5 times higher than that of the Reduced Fat Milk, this is a heart-healthy fat and need not be avoided. On the flip side, the amount of Sodium and Sugar in the Reduced Fat Milk is approximately 33% HIGHER than that of the Half & Half. And, this is what’s most important, as excess sodium has been targeted by the medical profession to be one cause of hypertension (high blood pressure). Likewise, we now know that excess SUGAR is the cause of many of the health conditions our population is plagued with, including diabetes, hyperlipidemia (high cholesterol) and heart disease. Based upon these facts, I would never drink a glass of skim milk or even use it in my morning coffee. It has less healthy fat and more sugar than it’s older, wiser ‘brother,’ Half & Half. Hopefully, you’ll start using Half & Half in your coffee if you currently enjoy drinking a glass of skim milk, you will make the switch to whole milk. (We have not analyzed whole milk nutrition here, but trust me that it’s better than skim! )., and will use as well as adding Half & Half to your coffee. In summary, it is crucial to examine your food labels carefully, as food manufacturers are known to change the serving sizes to make their products appear healthy compared to another. Additionally, it is better to focus on the nutritional value of food as opposed to the number of calories. Opting for higher healthy fat foods with lower levels of sugar will help you lose weight while also helping to keep your cardiac risk factors in check!